Named for the coldest, most unforgiving side of a mountain, The North Face prides itself on creating a genuine connection with the outdoors and those who love to explore it. We had the opportunity to listen to Stephen Youngblade, senior brand marketing manager, speak about the history of the company and its innovations at Nordstrom Live. Imagine it’s 1966 and you’re an adventure-seeker in San Francisco. The mountains are your playground and the snow is as much your friend as it is your foe. 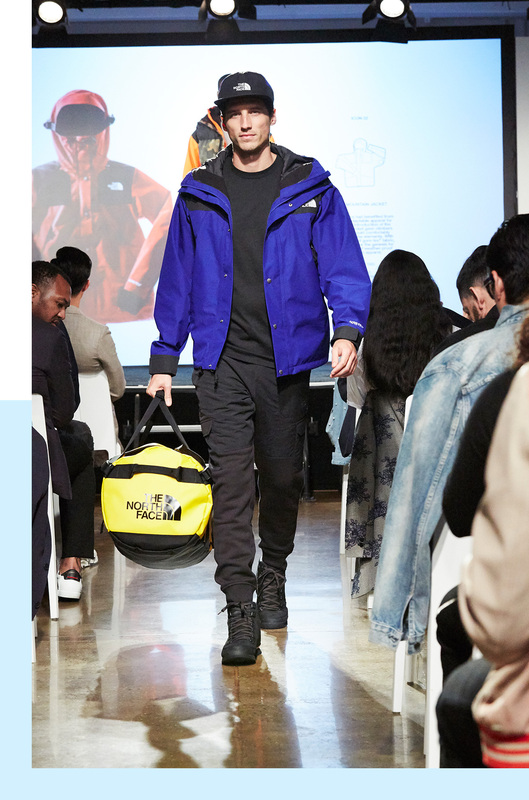 You’ve heard this new brand The North Face is something special, so you check it out. At the store opening, the Grateful Dead are performing and the Hells Angels are working security—you’ve finally found your people. “It was a startup,” Stephen says. “There was nothing iconic about the brand. 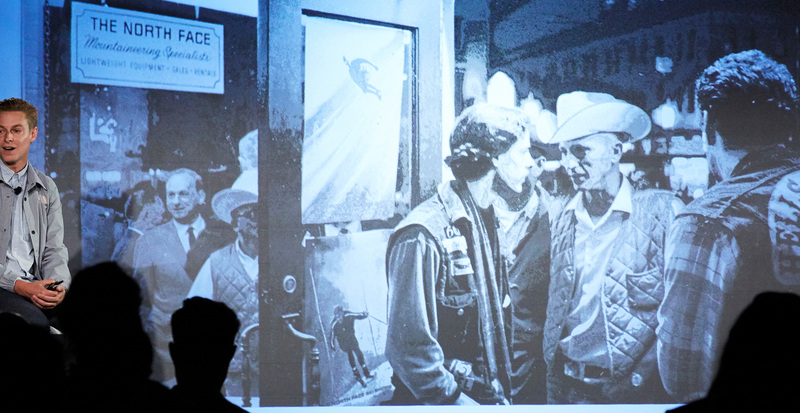 It was just an idea of, ‘How do we get people outside?’” What started out as a small cult following eventually gained traction. And like many athletic and performance brands, The North Face has since developed a loyal following among climbers, outdoor adventurers, and commuters who need some extra protection against the cold. The North Face has come a long way since that groovy grand opening in ‘66, but there are a few staple pieces that have become icons of the brand. Stephen explored three in particular that should be in your coat closet (if they’re not already). Debuted in 1985, the Mountain Jacket is undeniably the most famous from The North Face, with the iconic color-blocking we’ve come to associate with the brand. Extremely popular with climbers, it was created with athletes in mind. The pockets are designed on a slant, which allows the wearer to get to their gear much more easily than a pocket only accessible from the top. The North Face was the first to do this and it was a complete game changer. “Climbers are at the core of who we were designing this for,” Stephen explains. They also added goggle toggles to the hood, a small but vital detail. Connecting the hood to the goggles prevents situations where the hood could overlap with the climber’s vision, eliminating blind spots. When you picture a casual North Face layer, you’re likely thinking of the Denali Fleece. It’s made from ultra-comfortable recycled fleece with reinforced shoulders, chest, and forearms. “This piece totally crossed into culture,” Stephen says. “[It] became the de facto campus uniform in the late ‘90s and early 2000s.” And for good reason. Not only does the Denali Fleece perform in the outdoors, it’s comfortable and lightweight enough to be worn day to day. And the brightly colored fleece isn’t just a fashion statement. Youngblood notes that “the bold color is all about visibility.” The super-saturated and eye-catching hues are just as much a factor in safety as they are in style. Now available in hip- and duster-length jackets, vests, and bibs, these are the puffers you know and love. 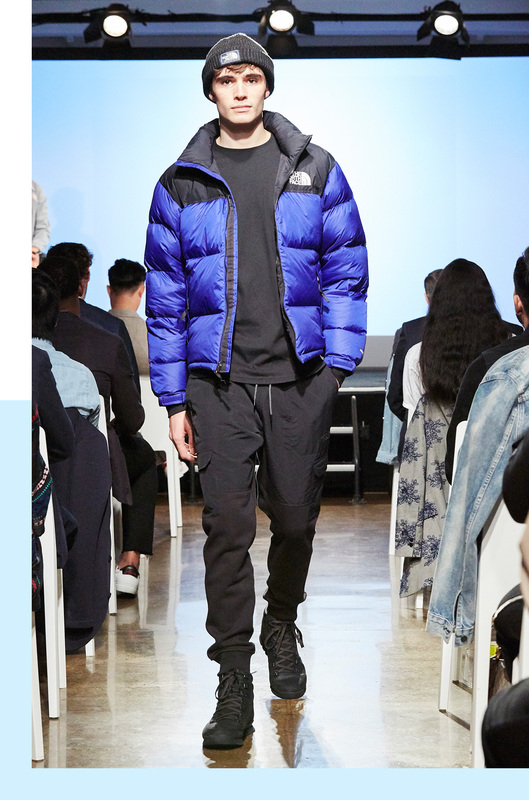 For some insight on how the Nuptse Jacket gets its “puff,” the secret is oversized baffles. Baffles are the chambers that store the down. 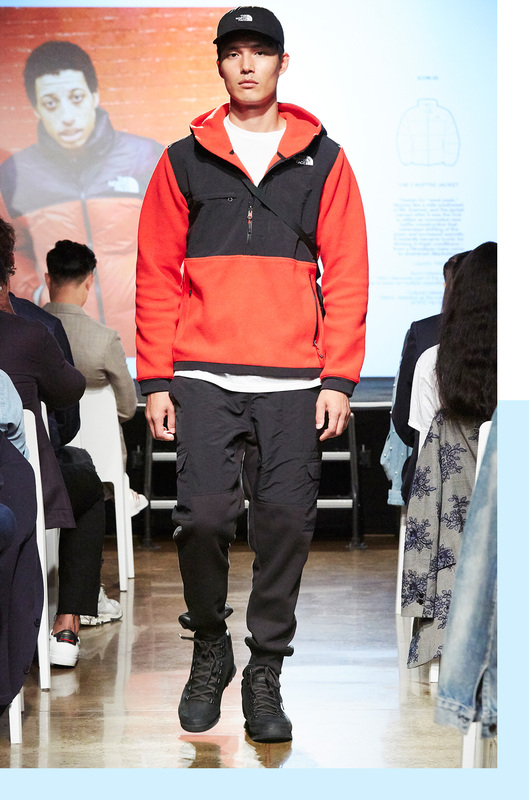 By creating these oversized sections, The North Face was able to fill them with “a ton of down,” making the jacket unbelievably light while also unbelievably warm. And just for good measure, it’s important to note that all of their down is responsibly sourced.